Melt the chocolate with 5 tbsp of the cream in a bowl over a pan of simmering water. Leave until tepid. Whip the rest of the cream until thick. Sift in the icing sugar. Chill. Carefully fold the chocolate into the cream, along with the orange flower water. Put into 8 serving glasses and chill for 1 hour. 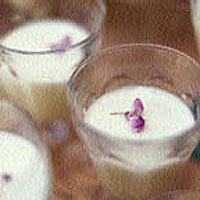 Garnish with flower petals before serving, if you like.